Rebellion, modern times, smart phones, apps, and Anomymous. Protest and Occupy. Old pothead pixie Daevid Allen serves up a wonderful farewell Gong record as he is folding the band due to ill health, yet on a vibrant, living, modern and youthful Gong way – family as one might expect, his son Orlando Allen and former wife Gilli Smyth contributing on this punky stew of Gongness called I See You, released October 2014. I have had quite some time to listen to it, but it from the get go had me rocking and bopping along to its rocky songwriting and Allen’s scatting. Most of the rest of the Gong crew this time are people unknown to me, but boy do they create a sublime Gong sound, from Teapot Trilogy madness and beyond. It sounds very true, its also very raw and heavy, much guitars and saxes, definitely, in spirit. Encased in a digibook full of lyrics and Daevid’s drawings it seems to even top the previous star studded Gong efford 2032 which to me was a fairly forgettable affair. This on the other hand is fresh. On the first song, it kicks off immediately, Daevid saying he is an old man… “not cool”! Occupy, Syllabub and Zion My T-Shirt are all protest anarchic Gongness – a shot of modern Here & Now style energy unheard of from Gong since Floating Anarchy and New York Gong when Allen was experimenting with Punk in the late 70’s. 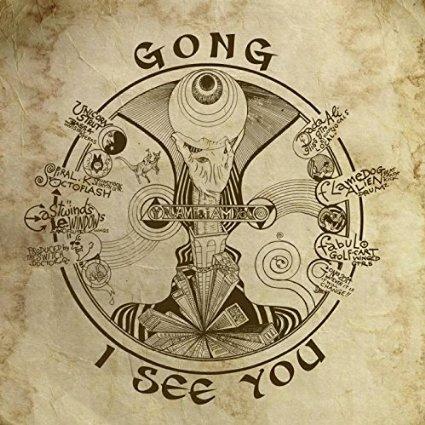 Old and new fans will adore this great album that carries the hippie/punk/anarcho sentiments in a format we all can relate to – the Gong way of freeform protest. The CD closes with Shakti Yoni & Dingo Virgin with Daevid and Gilli, the essence of the core Gong. Gong Est Mort, Vive Gong! Buy this album and never regret it, its the last call for Gong as we know it!